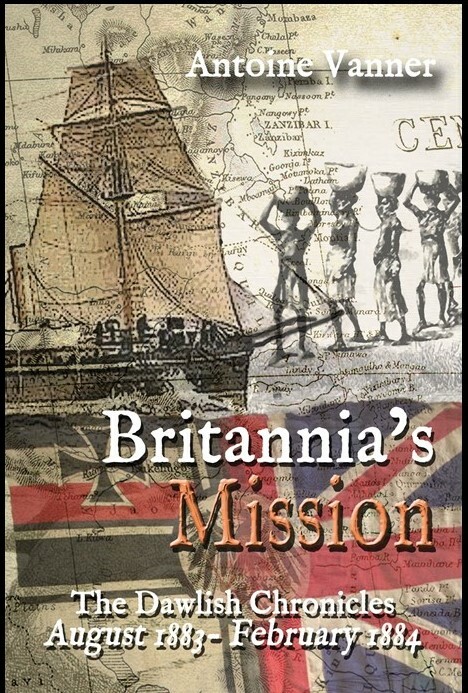 Today, November 30th 2018, sees the publication of my latest novel, Britannia’s Mission. Like all books in the Dawlish Chronicles series, the plot and action are linked to real events, persons and political developments. 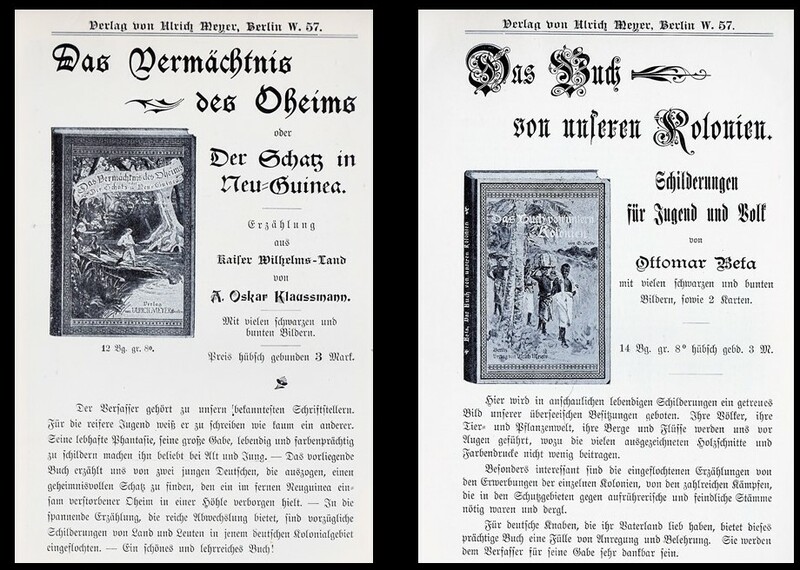 Set in 1883, one of the major themes is the arrival of the young Imperial German Navy on the world’s oceans and growing German interest in colonial expansion. (Details of the book at the end of this article). I therefore though it appropriate to concentrate in today’s blog on the creation of a naval fighting force that was to be characterised by professionalism and efficiency from the very start. 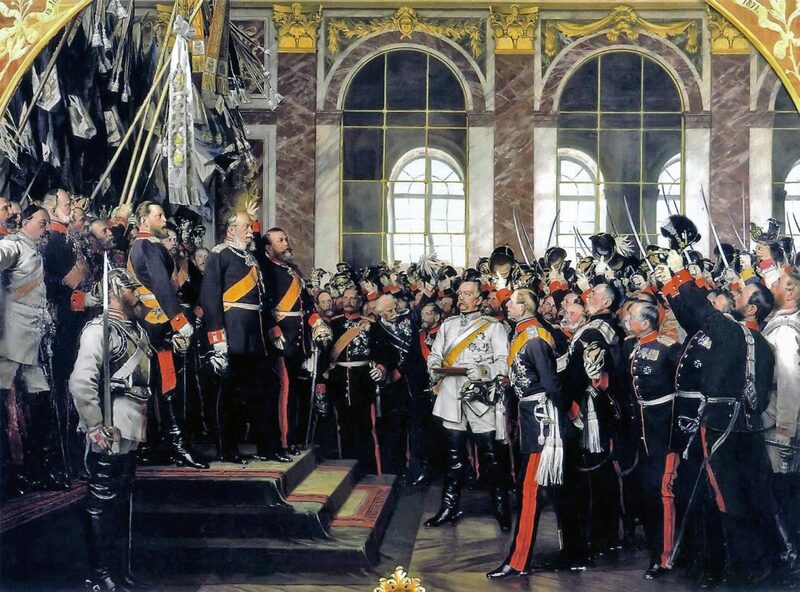 German unification was finally achieved in January 1871 when the King of Prussia was proclaimed Kaiser Wilhelm I of the new German Empire by the monarchs and rulers of the individual German states, some of which had sided with Austria-Hungary in its war with Prussia less than five years before. The event took place in the Palace of Versailles while Paris was under siege by German forces – the prelude to the crushing defeat of France that would see now-imperial German troops parade triumphantly through its capital only six weeks later. Sea power had played no significant role in the war. French ineptitude had prevented it using its overwhelming naval superiority to impost a strict blockade on German ports. The naval forces available to the North German Confederation, comprising Prussia and other states, were too few and too weak to exploit this situation. The war left the new German Empire and its army the greatest military power in Mainland Europe. In the war’s immediate aftermath little attention was paid to creation of equally powerful navy – its role was seen primarily to be one of coast defence. Vessels constructed in the 1870s reflected this and, though the Imperial German Navy was established as an independent organisation, its overall command was entrusted to senior army officers until 1887. The first “modern” German cost defence vessels were of the four-ship Sachsen class, 7,635 tons and 322-ft long. Built between 1877 and 1880, they were designed to operate as part of an integrated coastal defence network and intended to sortie from fortified bases to break up enemy blockades or attempted landings. They were to operate close to shore and not on the high seas. Armed with six 10-inch guns in open barbettes, as well as smaller weapons, the Sachsens were powerful ships for the time. Their unusual layout allowed four of 10-inch guns to fire directly ahead, three to do so on each broadside and two directly astern. Their four funnels, set at the corners of a rectangle, apparently suggested the nickname of “The Cement Factories”. As part of this coast defence strategy significant expenditure was made on construction of two new fortified bases, Kiel on the Baltic Coast and Wilhelmshaven on the North Sea. The construction of the Kiel Canal, commenced in 1887, linked the Baltic and North Seas, and rapid transfer of warships between them when required. The focus on coast defence continued until the 1890s, when the first class of ocean-going battleships, the Brandenburgs, were constructed. Well in advance of this however, other German warships had been seen on the world’s oceans from the early 1880s onwards. There were two drivers: (1) the need for training officers and seamen to the same standards of professionalism and efficiency as the German Army and (2) growing German interest in acquisition of overseas colonies. The first was obvious from the start but it was not for a decade after the victory over France that Chancellor Otto von Bismarck was persuaded that colonies could indeed be desirable. The pressure for them came initially from commercial enterprises intent on securing access to overseas markets and natural resources. In several cases independent freebooters and visionaries forced the pace by their own efforts to establish a German presence, and in the process they forced the government to follow suit. The results were spectacular. In the thirty years up to World War 1 Germany acquired large and wide-spread territories, not just in Africa (what are now Namibia, Tanzania, Togo and Cameroon), but in Northern New Guinea (“Kaiser Wilhelmland”), New Pomerania (now New Britain), the Bismarck Archipelago, and the Solomon, Caroline, Marshall and Marianas island groups of the Western Pacific which became major battlegrounds in World War 2. Germany also tried, unsuccessfully, to buy the Philippines from Spain in 1898, before the US could establish a presence there in the aftermath of the Battle of Manila Bay. In due course Germany would also have a naval base, Tsingtao, on the Chinese coast. Settlement in these colonies by Germans was sparse – there may have been more Germans living in France in 1914 than in all the colonies put together. Support of these colonies demanded, on occasion, naval support. 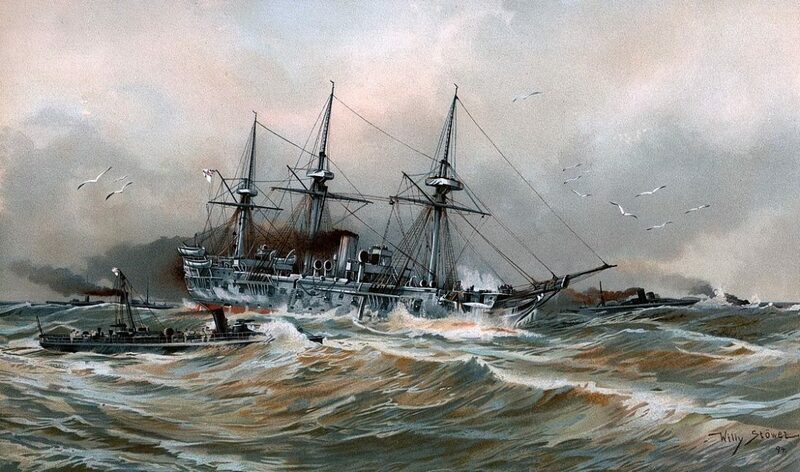 As with the “Naval Brigades” that were so characteristic of Royal Navy responsibilities in this era, the Imperial German Navy proved equally adept of sending seamen ashore in an infantry role, supported as necessary by gunfire from their ships. One of the earliest of such actions was intervention in a civil war in Samoa in 1887 and 1888. The ships needed high endurance and range. Retention of sailing rigs to complement their steam engines was desirable in stretches of ocean where coal supplies would be hard to come by. An added advantage was that such ships proved ideal for training purposes, and for rapid fostering of a naval tradition, ethos and espirit-de-corps in a recently created navy. Typical of the “blue water” German ships of the period were the six ships of the Bismarck-class, built in the 1875-1880 period. Of some 3000-tons and 270-ft, these vessels carried a powerful armament of ten 5.9-inch breech-loaders. The large crews that could be accommodated – some 380 men – made them ideal ships for training. All saw service on a global basis, including support of colonial acquisitions. Even more impressive was the last sail-equipped warship constructed for the Imperial Navy. 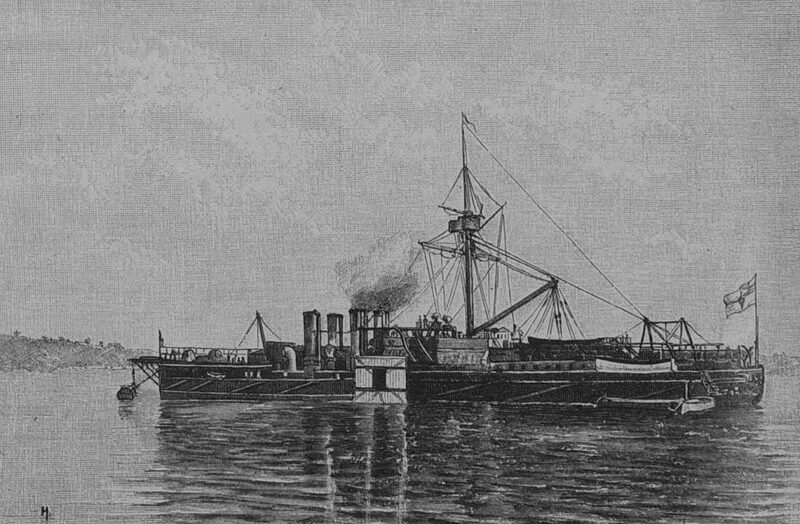 SMS Charlotte was commissioned in 1886. Of 3700-tons and 275-ft length, she carried no less than eighteen 5.9-in guns and had accommodation for a crew in excess of 500. This suited her training naval cadets and apprentice seamen, which she did for her entire career, her 3100-hp engines, which have her a maximum speed of 13.5 knots, providing exposure to steam machinery as well as navigation, gunnery and sailing skills. 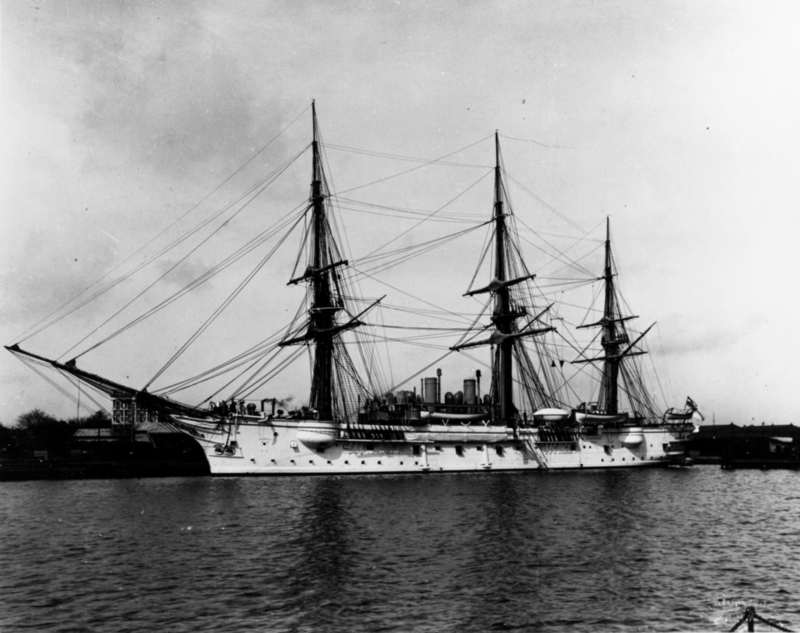 She cruised widely overseas and in 1899 had the distinction of making the first visit of a German warship to French ports since the Franco-Prussian War. Imperial Germany participated in no major international conflicts in the years between 1871 and 1914, though there were many minor colonial interventions and participation in anti-Boxer operations in China. When war did however come in the latter year it was equipped with a navy second only to the Royal Navy in strength and with officers and men trained to a superb level of professionalism. 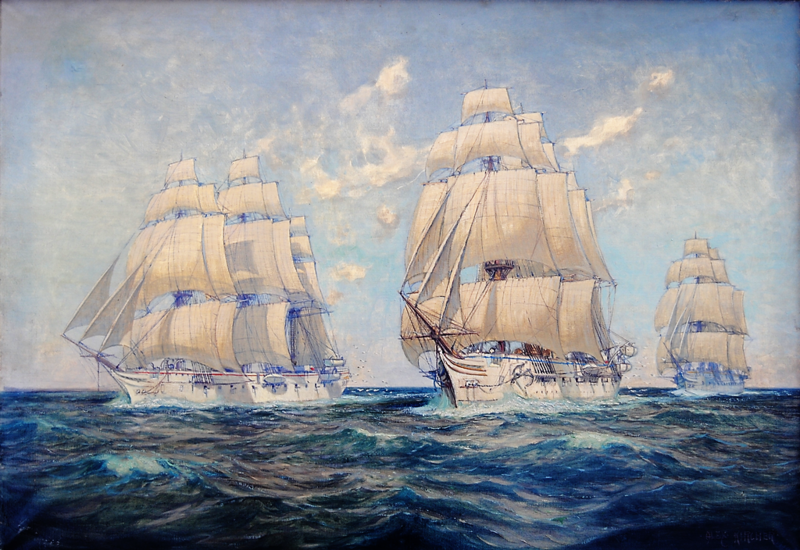 And the foundation for that professionalism was laid by vessels such as SMS Charlotte. 1883: The slave trade flourishes in the Indian Ocean, a profitable trail of death and misery leading from ravaged African villages to the insatiable markets of Arabia. Britain is committed to its suppression but now there is pressure for more vigorous action . . .
Two Arab sultanates on the East African coast control access to the interior. Britain is reluctant to occupy them but cannot afford to let any other European power do so either. But now the recently-established German Empire is showing interest in colonial expansion . . .
With instructions that can be disowned in case of failure, Captain Nicholas Dawlish must plunge into this imbroglio to defend British interests. He’ll be supported by the crews of his cruiser HMS Leonidas, and a smaller warship. But it’s not going to be so straightforward . 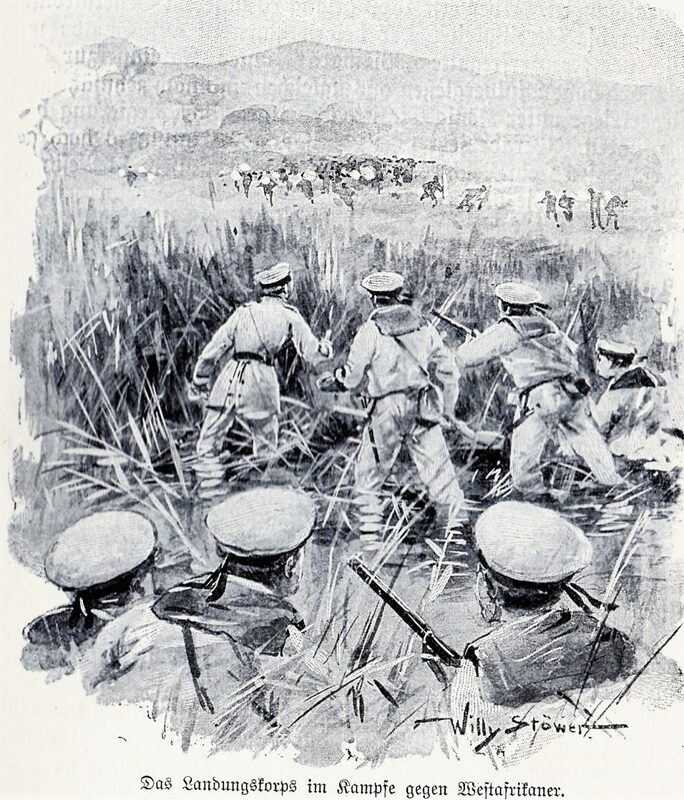 . .
Getting his fighting force up a shallow, fever-ridden river to the mission is only the beginning for Dawlish. Atrocities lie ahead, battles on land and in swamp also, and strange alliances must be made. And the ultimate arbiters may be the guns of HMS Leonidas and those of her counterpart from the Imperial German Navy. In Britannia’s Mission Nicholas Dawlish faces cunning, greed and limitless cruelty. Success will be elusive . . . and perhaps impossible. Registering for the Dawlish Chronicles mailing list by clicking on the banner below, will keep you updated on new books and facilitates e-mail contact between Antoine Vanner and his readers. You’ll also get four free short stories to load on your Kindle or Tablet.